Summary of today’s show: Brian Boyle has reached the apex of his profession, a career that many young kids dream about, as a professional hockey player with the NHL’s New York Rangers. Scot Landry and Fr. Matt Williams talk with Brian and his father, Artie, about his faith journey, how his father’s struggle with and miraculous cure from cancer affected him, the discipline and commitment it took to get where he is today and to stay there, and how his faith, family, and friends as his top priority in life keep him in grounded in the sports media spotlight. 1st segment: Scot Landry and Fr. Matt Williams caught up his busy summer. Last week, they had a retreat called Witness to Truth, a leadership retreat for high school students. Next Thursday they are doing a similar program for middle school students. For middle schoolers who are interested should check out the Office for the New Evangelization of Youth and Young Adults website at http://www.one4boston.org. Today’s show is a followup to two shows they did last summer interviewing Artie Boyle about the miraculous cure of his cancer. 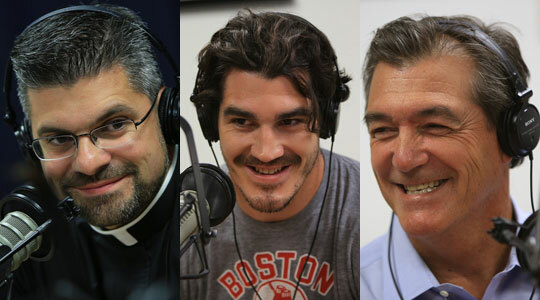 Today Artie returns with his son Brian Boyle, NHL player and one of Artie’s 13 children. 2nd segment: Scot said there’s been a tremendous amount of feedback on the shows with Artie last summer and asked Artie if he had any updates. Artie said the good news is that his health is still good. He said he also just came back from Medjugorje with a group of young people, including his two youngest sons who went for the first time. Scot said he’s heard that Brian didn’t know how ill his father was when he was going through it. Brian said he remembers as a teen being floored by the news when he was at a church in Hanover and his father gave his witness to a confirmation group. In the talk, his father said he thought he was going to die and Artie had protected his kids from that news. Artie said he thinks its more difficult for the spouse and children of the sick person to go through with it than for the sick person himself. He said his family was busy with their own lives. Artie said he had just been diagnosed with the metastatic cancer and Brian had just been taken into the junior NHL hockey league in Canada and so he went up to Canada with Brian to experience it with him. Brian said he can’t imagine what his father went through with all the people in his life he’s taking care of. As he gets older, he understands even more what Artie did and how he kept everyone together. It’s amazing how his dad traveled with him to a remote area in Canada on two or three planes and a long bus ride. Scot asked Brian what it was like to go to Medjugorje knowing it was the place where his dad was likely healed of his cancer. Brian said it was impressive, especially how far it took to get there. He was 18 years old, right before the NHL draft and after high school graduation. He was under a lot of pressure, but going over there he felt a lot of peace. He understood the most important part of life. It was easy to walk up the mountain and be consumed in prayer. Fr. Matt said we often talk about the importance of a mother and father in being handed on the faith. Brian said it’s just impressive how they got everyone out of bed and to church on Sunday morning, but it’s important because it became part of his life and as he got older he got more out of it. He learned to work hard at school and sports and be self-motivated because it was a gift from God and he had a responsibility. Fr. Matt said our humanity is the bridge by which people can encounter Christ. He said it’s amazing to see their selflessness in the lives of their kids and how it translates into so many ways they shaped their faith. FR. Matt asked how going to Medjugorje further shaped his prayer life after he returned. Brian said the confession in Medjugorje was the biggest change. Before, he was afraid of the sacrament, especially having to verbalize what he had done. But over there he went to confession and realized he could release the burden he didn’t even know he was carrying. Going over there opened up for him all the things it can do for you. Scot said Artie said last year he’s never said no to invitation to share his story. Scot said he’s sure thousands have come to a deeper relationship with Christ through his store; how does he feel to know his story has helped his own children. Artie said it’s humbling. He and his wife Judy want nothing more than his children to believe in Jesus Christ and to follow him. Artie said every time he gives his talk, it feels like he’s being healed all over again. He always says Yes because he someone may need to hear the story. Artie said their children are passing on the faith to their own children. Their one responsibility as a parent is to pass on the faith to their children. You can’t force it on them. All you can do is live it as a witness. 3rd segment: Scot said Brian went to St. Paul in Hingham and St. Sebatian’s in Needham for high school. In his senior year, he was invited to participate in the NHL draft. Brian said it was very stressful, measuring yourself against the others, wondering which team would pick him, what round they would pick him in. He said it helped him mature a lot before going on to college. He flew down a couple of days early to Nashville for the draft. He had to do workout drills and they pick them apart and strip them down for their strengths and weaknesses. There were 30 from the family down there total. He was picked 26th overall. It was a whirlwind after that and finally later it all sunk in. Unlike the other leagues, when you’re drafted in the NHL he can choose to go to college. Going into the draft, Brian knew he was going to Boston College. His first year in college was tough with many ups and downs. He’d known being drafted was no guarantee, but he knew he would make it to play in the league. Those experiences helped him with his work ethic and being able to take ups and downs. Scot said at Boston College the team made it two championships but never won. He asked how the closeness of family helped him. Brian said it was a dream of his to play for Boston College. He’d always cheered for them. In senior year when they lost to Michigan State was the worst loss for him and took longest to get over it, but being with his family helped him through. He said his dad took it even harder. Artie said he grew up playing all sports. He played hockey goaltender in college and still plays. He said hockey players are a little more caring for their teammates than the other sports. Scot noted that he’s seen the Bruins have always been a little more down to earth than the other athletes. Brian said he’s found that among every hockey team he’s played on. Selfish players are weeded out early. He said it’s difficult to understand that you’re always fighting for your job, but the culture is still caring for the whole team. They don’t care who gets the goal as long as the team scores. It’s one reason there’s fighting in hockey with guys standing up for each other. Scot said after college Brian played in Manchester in the minor leagues and then went to the LA Kings. He was asked to play a different position as defense instead of forward, which he’d played all his life. Now with the Rangers he’s back to his old position. Brian said he was a center his entire life until the last eight games of his senior year when injuries on his team forced him to play more defense. When he turned pro he was put on defense and had to spend a lot of time trying to understand the brand-new position. Over 30 games in Manchester he played D and it did give him an understanding of the position and how to use that as a center in the defensive zone. In the long run, that’s helped it become a big part of his game. Scot asked Artie about reports of a meeting between Artie and the general manager of the Kings, asking him to trade him East if he’s not going to use him the way he should. Artie said he’d known Dean Lombardi socially as a friend of a friend and so when he heard he was coming to Boston and arranged a meeting. They met for an hour at the airport Hilton to tell him about Brian, talk about his character and makeup so they wouldn’t try to make him something he isn’t. He understood Brian as a goal scorer. He asked if they plan to trade him to trade him East so they could see him play. A month later they traded him to the Rangers. Scot said Judy, his mom, had been praying a novena to be traded East. Brian said he wasn’t aware of his father talking to the general manager of the hockey club and when he heard about it he was nervous. Dean was understanding and was willing to do what was right for Brian. He’s very happy in New York and thinks it’s the best place to play, within an hour of home without being in front of the hometown crowd. Artie said his first night in New York, his mother told him she couldn’t control herself, crying because he was so close. He didn’t realize until he came back how much he missed his family and being close to home was a huge plus for him. Fr. Matt asked what it’s like to make it to the professional level and play in New York, night and night out with the pressure, and media scrutiny, and how he gets through it, especially with his teammates. Brian said he’s been on both sides of the scrutiny. He said the fans have been supportive of him in New York. He said there’s pressure even inside the locker room with the coaching staff and other players. they make sure your attitude doesn’t change at all and that you remember you’re part of a team. For Brian, he downplays everything else. He always remembers that they’re just a bunch of guys playing the game, that they’re all human. If you lose today, there’s another game tomorrow, and if there isn’t another game tomorrow, then leave it all out on the ice. Scot said when you get to the apex of your profession, how complete is it for you? What can he say to teens about the balance of his life. Brian said it was always his dream to play in the NHL. Being able to do that, he’s always striving to be better and then to achieve the ultimate goal of the Stanley Cup. Hockey is a huge part of his life, but it’s not who he is. The biggest part of his life is family, friends, and faith. Those have been with him through the ups and downs of life. The best games are when he can talk to his dad after the game or to have his family there. Hockey is more fun when his family is part of it. And they’ve taught him that his faith is number one. Fr. Matt asked how he lives his witness as a Christian on the ice, off the ice, in the media room or wherever. Brian said hockey is funny because of the violence in it. Before every game he prays, right after warm up. He says the novena to St. Jude because that was his confirmation name and they prayed it when he was struggling in freshman year in college. He then goes out with then intention to do his best to glorify God with the gifts he as given Brian. In his interviews he gets to tell people how blessed he is to play in the NHL with the NY Rangers. Scot said New York is the media capital of the world and asked Artie what it’s like to deal with the ups and downs in the NHL, especially when they saw a cheap shot on Brian in the playoffs that knocked him out of playing for a few games. Artie said he was at the game and was concerned that he’d been hurt after he disappeared off the ice. After the game, they were called into the locker room. He saw the nasty hit on replay. Brian had a concussion and it took him a while to recover from that. They temper the ups and downs, scoring and getting hurt, playing too little and too much. Artie said he gets so personally involved that his wife Judy says he’s playing in his son’s body. Fr. Matt asked Brian about the discipline he goes through to go for excellence and how he stays motivated. Brian said the best example is getting up early on a Monday morning to drive an hour in July when the season just ended and next season is months away. It’s a challenge but he also has seen what happens to guys who don’t put in the work. The way he’s been brought up and the way he’s learned all along the way that he has to make this priority, that you have to work hard and not give in to temptations. Scot asked Brian what advice he has for kids playing in whatever sport about reaching the apex of the sport. Brian said the number one thing is that winning as a team is more important than personal accomplishment. Teams want winners who’ve contributed their individual effort to the ultimate prize. Brian said he’s always been passionate about victory at the end of the day. You can’t accept losing in yourself and always look to improve yourself for the next time. Brian’s younger brother was just drafted by the NHL. He said he was even more excited for that than for his own draft. Artie said his others kid include a doctor with seven kids, a real estate broker, school teachers, retail, an MBA, two in high school, and the drafted hockey player going off to college. I’m not sure how to start this email but after listening to Mr. Artie Boyle and crying my eyes out I was inspired to write to you. I lost my dad to lung cancer (original diagnosis) 7 years ago and now my best friend, Aggie, has been diagnosed with brain cancer and I’m not sure how to deal with it. I have to be strong for her but yet I’m lost…I’m not the patient. Long story short, she is married, she has a year and a half child and her husband is in a chemical explosion 2 months before she is due with their second child. He survives the explosion with 2nd/3rd degree burning to his arms and one side of his neck. This happened in beginning of October and she gives birth to their second child, boy, in November. All is going well until she got this major “migrane” on Christmas eve. She went to the doctor on the following Saturday and was diagnosed with 2 inch brain tumor!!!! On Sunday, while in the hospital, she was going into a comma having seizures and her husband and sister had to make a quick decision of having a brain surgery. Well, Dr. Kaptain operated on her and she was back home on Thursday. The day she woke up, after the shock of being operated on, she asked to receive Jesus in the sacrament of communion. That weekend many people all over the world prayed for her and still continue to pray for her and her family. Unfortunately, the following Tuesday, she was told that it was cancer and she has to go under chemo and radiation. Through it all SHE has thought me that surrendering to GOD is the only way. She has asked to God to be healed just like Mr. Boyle did and maybe she has been healed in many ways but I want to ask you to please reach out to Mr. Boyle and ask him to pray for my best friend-sister Aggie and her family. I have been following hockey for many years and it has never lead me to God until today. I was watching NY Rangers vs. Philly looking up stats on Brian Boyle and it lead me to you. I’m not sure what the connection is but I’ve heard of Medjugorje for years and I know of people who have gone there but for some reason, your program with Fr. Matt and Mr. Boyle has moved me. I plan on listening to the show couple more time and share it with Aggie and even to take a trip to Medjugorje. Actually, the two of us took a trip during our college years (while back :)) to Canada where there were signs of apparition….there are so many aspects of Mr. Boyle’s talk that I can associate with that I really felt inspired to write to you since I can write directly to him. Please ask him in my name to pray for my friend Aggie for I know she WILL be healed!! !